Taking over from a defunct Food 4 Less, 99 Ranch Market last October opened a warehouse-style grocery with an adjoining food hall, the first food hall to open in the Inland Valley. How about that? 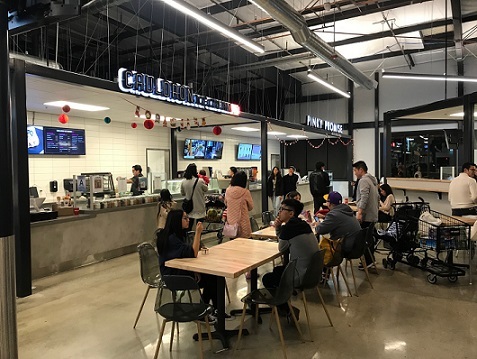 It’s in the Spectrum Marketplace shopping center and has nine food vendors: Cauldron, Dos Chinos, Madbun, Oi, Pinky Promise, Red Envelope, Shomi Noods, Tenori and Wingman, plus Piju, which sells international beer and wine. They’re all Asian, sometimes fused with another cuisine. The food hall is close to Chino Hills and its growing Chinese population. 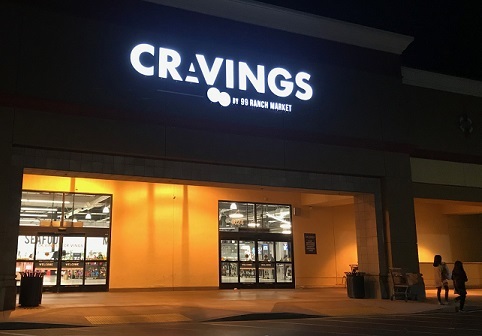 Cravings’ sheer existence must bring cheer to the area’s Asians, not to mention those of us who like trying different foods. My photographer colleagues Watchara Phomicinda and Cindy Yamanaka visited during a pre-opening event for a photo gallery and brief story. And LA Eater wrote about most of the vendors’ origins. The food hall was curated by Andy Nguyen, whose Afters Ice Cream you may know; he’s behind Cravings’ Red Envelope and Wingman. I’ve visited twice so far. The first was in early January with a friend who had eaten there once already. We were there in the evening. You can wander among the food stalls, stroke your chin eyeing the menus, get what you like and then take a seat in a communal seating area. Each place will give you a buzzer that will alert you when your order is up. 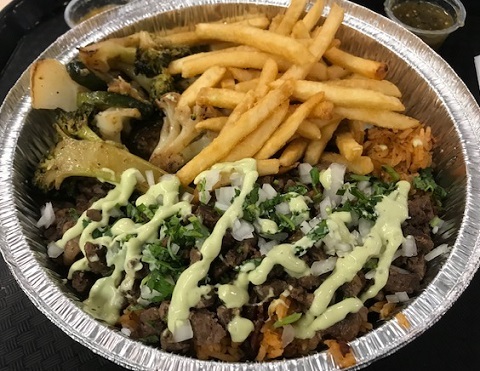 She got an asada plate with chorizo fried rice and garlic fries from Dos Chinos ($10.75). 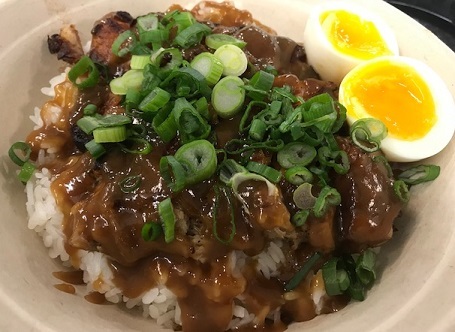 I got a Filipino-style adobo bowl ($9) from Oi Asian Fusion, which had a soft-boiled egg, pork belly, rice and adobo sauce. We liked the food fine but each felt it was lacking somehow. 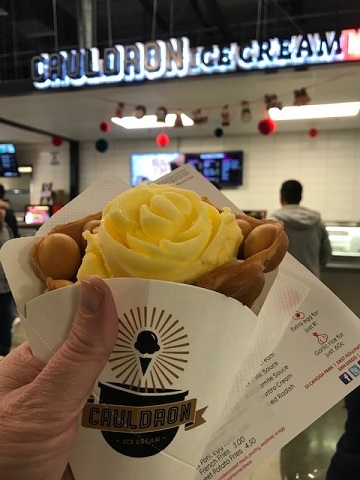 I also got a pineapple express Dole whip in a Hong Kong-style puffle cone from Cauldron ($6). I was asked: “Would you like it shaped into a rose at no extra cost?” I would. Earlier this week I went back for lunch with a second friend to try more vendors. 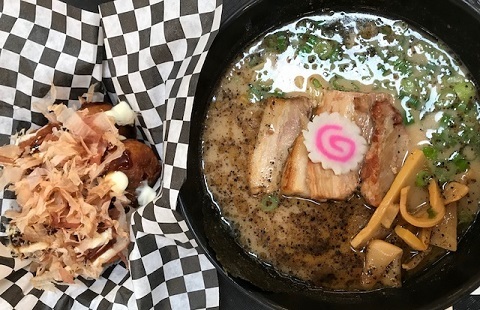 He got black garlic ramen ($10) from Shomi Noods. Despite the garlic in the name, he thought the ramen lacked punch. We shared an order of takoyaki ($5.45), minced balls of octopus. There was no discernible octopus. 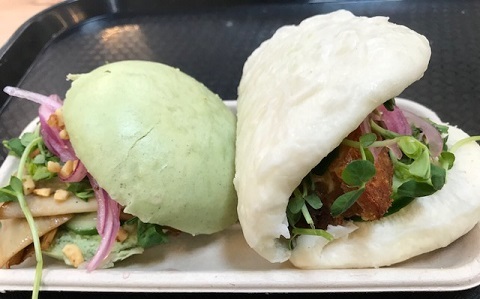 I got two bao buns from Madbun, which had a lunch special: buy one, get one half off. I got a crispy pork on a regular bun and a hoisin mushroom on a matcha bun ($7.49) and preferred the pork bun. 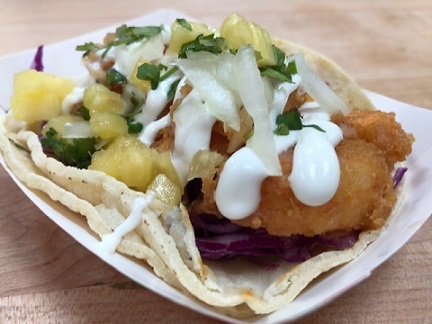 Still peckish, I went to Dos Chinos for a single taco: Oahu shrimp ($3), with fried shrimp, red cabbage, sour cream and pineapple. Not bad. 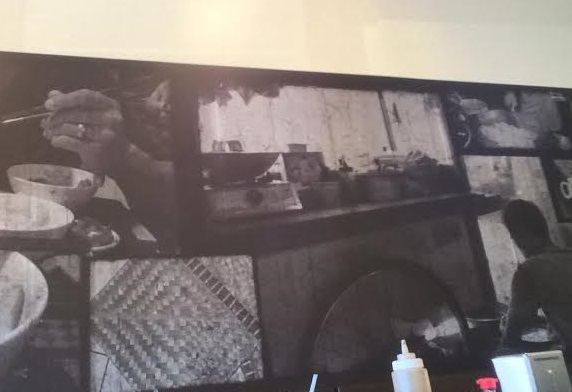 About halfway through our lunch, a Piju employee walked over to a music speaker a few yards from us, got up on a ladder and turned the volume up about twice what it had been. That was unfortunate, but maybe the young folk were pleased. Cravings wasn’t exactly busy either time I was there, a Friday night and a Tuesday lunch, but it was populated, mostly by Asians, and of a wide range of ages, including families. “I want to like this place. I might not be picking the right things,” said my friend from the January visit. I know what she means. The food isn’t wowing me, but it’s all right, the concept is neat and it’s a fun place to meet up. You ought to try visiting once. Formerly a Lollicup, this small eatery has a new name. Not a great name, but a new name, since June, with new owners to match. 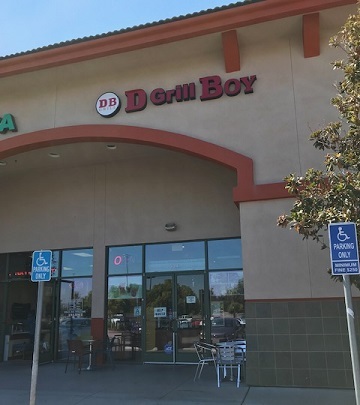 A friend and I checked it out recently for lunch. D Grill Boy is an unassuming place, mod and with communal tables. 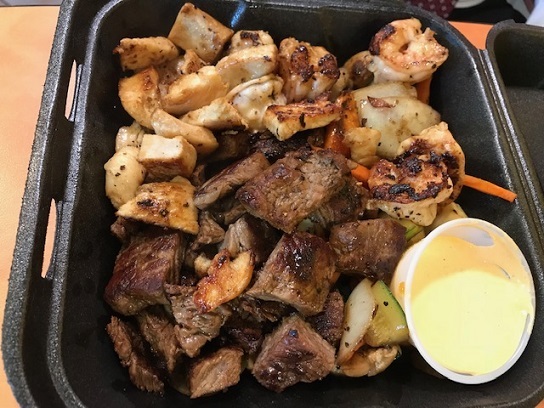 The menu is mostly hibachi-style grilled entrees — chicken, steak, shrimp, salmon, lamb or chicken katsu — with rice and vegetables. You won’t get a floor show from the chefs, like at Benihana, but you’ll also pay a lot less. There’s also yakisoba dishes (stir-fry noodles with chicken, shrimp or steak), which are Japanese, and loco moco (rice, gravy, eggs, with sausage or Spam), which is Hawaiian. Additionally, they make tea drinks, milk tea, slushies, smoothies and salted cheese teas. 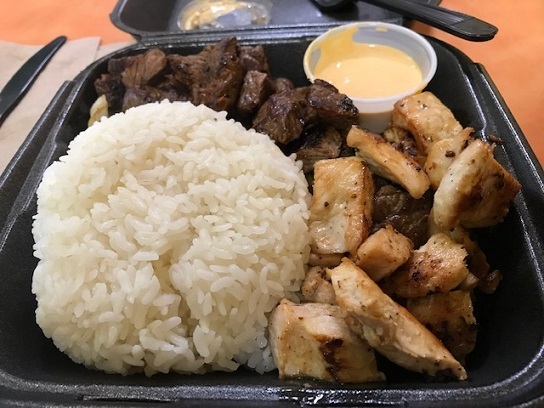 I had steak and chicken ($11.59) with — why not? — one of the salted cheese drinks, a matcha green tea with cheese foam ($5.29). My friend went one better by getting steak, chicken and shrimp ($14.59), with an upgrade to fried rice ($1.50), plus a watermelon slush ($4). He pointed out something about the steak and chicken that I was beginning to notice myself: They tasted, essentially, the same. Had I closed my eyes, I might not have been able to tell the difference. As a non-cook, I couldn’t tell you why they would taste the same, but maybe were both overdone. “The shrimp was the best — by far,” my friend concluded. Our drinks were OK. (I didn’t like mine $5.29 worth, but I liked it.) You might be better off getting a beverage here than food: There are many more options, including 16 slushies and 15 smoothies. 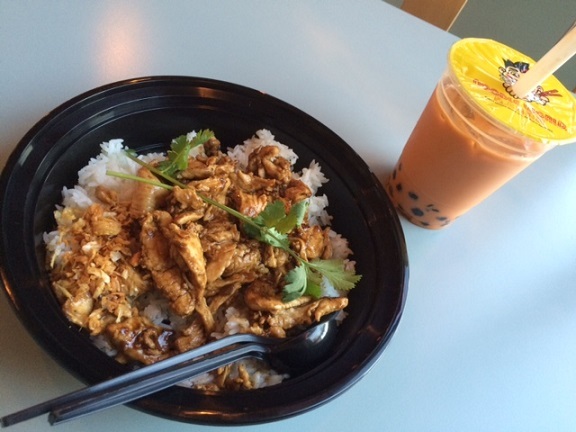 Overall, the food might be comparable to WaBa Grill — but unlike WaBa, you can get boba. And maybe that’s enough. This small brown building squeezed between a Shell station and the Stater Bros. center was home to Inka Trails for many years and Jeni Wren’s for under a year. 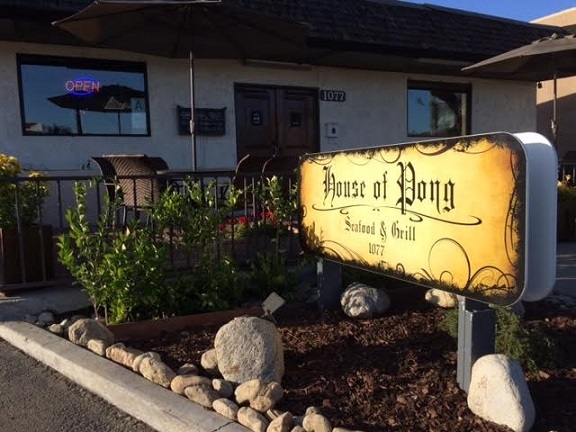 It’s now House of Pong, an Asian fusion restaurant, although you could be forgiven for reading the Gothic script of the sign as something slightly racy. Someone else had recommended it to me as a great small plates place, but I was skeptical, figuring the restaurant would close before I could get there anyway based on the location. But months later, it was still open when a friend suggested it for dinner based on the 4.5-star Yelp rating. So we took a chance. 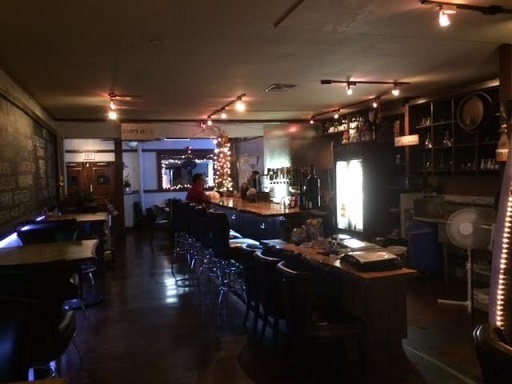 The rustic interior has been redone, and a bar has been added. It was a slow weeknight and we were the only customers for a long stretch. The server was attentive, but then, she didn’t have anything else to do. The menu has salads, soups, sandwiches and entrees, many seafood-based, including ramen, udon, yakisoba and rice bowls. It was tricky figuring out what combinations of plates from the wide-ranging menu might make a satisfying meal. We split an appetizer, Flamin’ Cheesy Cheetos ($7), which were mozzarella sticks covered in crumbled cheetos, and strangely addicting. 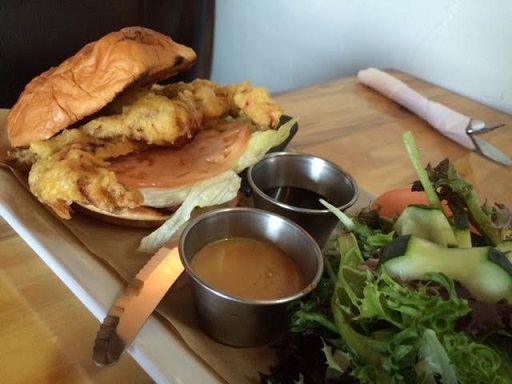 My friend had the soft-shell crab sandwich ($13), served on Hawaiian bread. He said there was a lot of crab but that he mostly tasted the breading. I had the salmon skin salad ($8) and Under the Sea soup ($7). 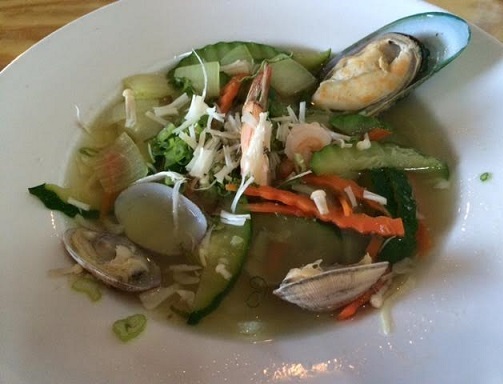 The soup, with scallop, clams, mussel, shrimp, zucchini and onion, was lukewarm and seemed made up of individual ingredients. The salad was better. 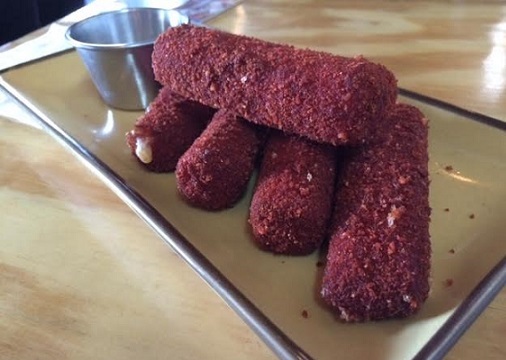 Some of the Yelp photos look better than what we had, so we might just have ordered poorly. That said, the rapturous reviews didn’t match our experience, and I can’t recommend the place. 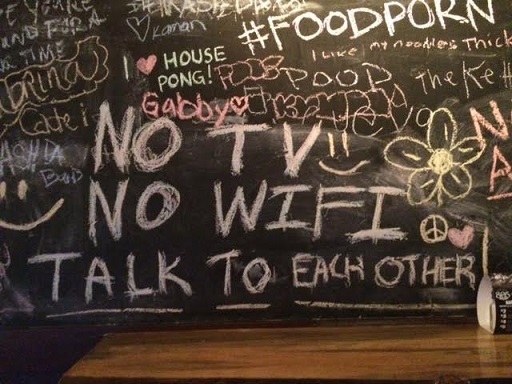 Cute chalkboard, though. 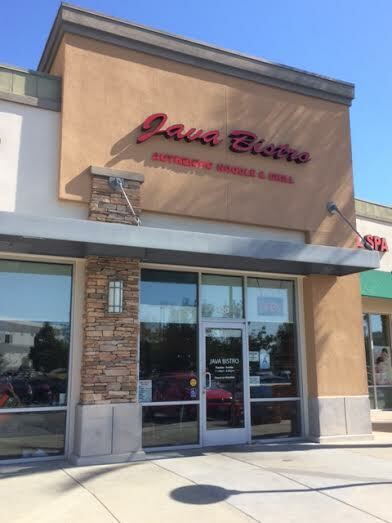 Java Bistro, 9090 Milliken Ave. (at 7th), Rancho Cucamonga; closed Mondays. 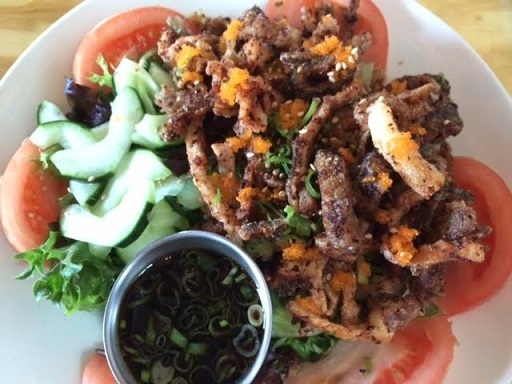 Did you know there’s an Indonesian restaurant in Rancho Cucamonga? It might be the only one in the Inland Valley. 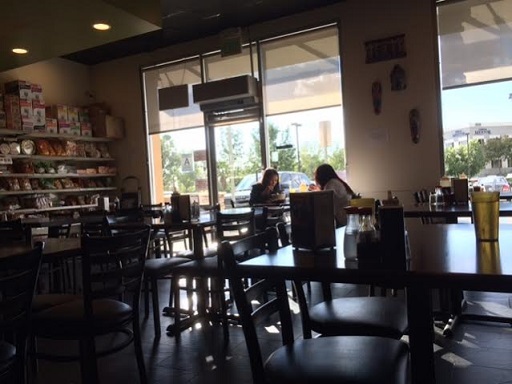 Java Bistro opened in February in a small complex that also has Gandolfo’s Deli. Reader Andy Sze drew my attention to Java Bistro’s existence. The staff will show you to a table and hand you a glossy menu, which has photos of many of the dishes. 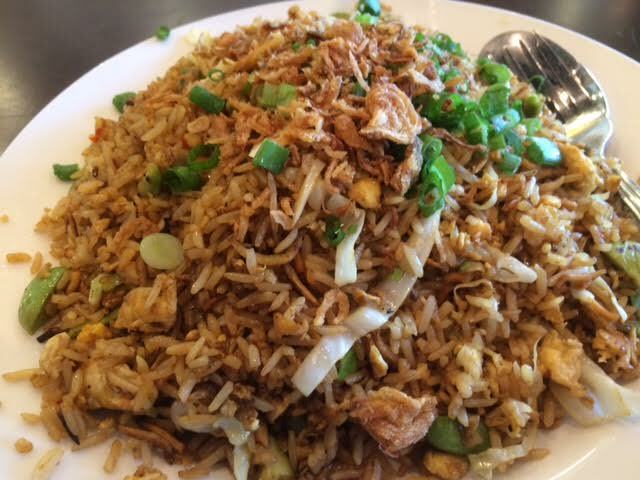 On my first visit, I tried the anchovy fried rice ($9), because I like anchovies. The dish had the saltiness you expect from anchovies, as well as having sator, an edamame-like bean. I took about one-third home for a second meal. I wish I had ordered a second dish for contrast because this one by itself kind of wore out its welcome. 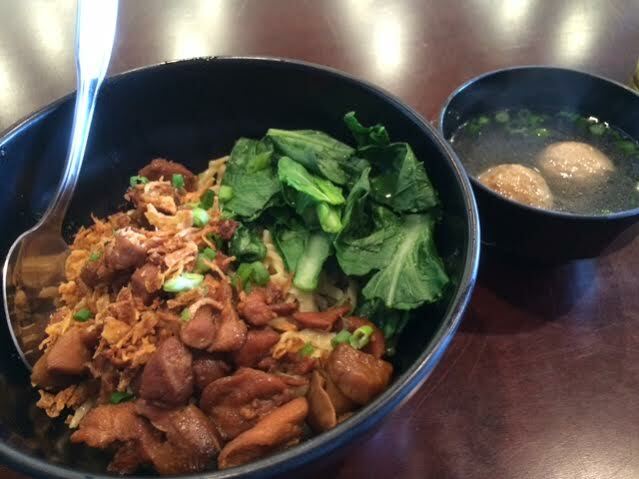 On my second visit, I got mie ayam jamur, or chicken mushroom noodle ($7.50). This was a bowl of noodles with the aforementioned chicken and mushrooms, plus vegetables, and was delicious. A cup of soup — meatballs in broth — came as a side. 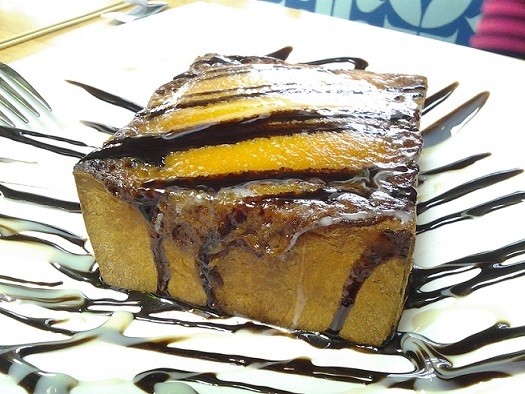 Java Bistro is a good spot for the slightly adventurous. I like it and hope they succeed. 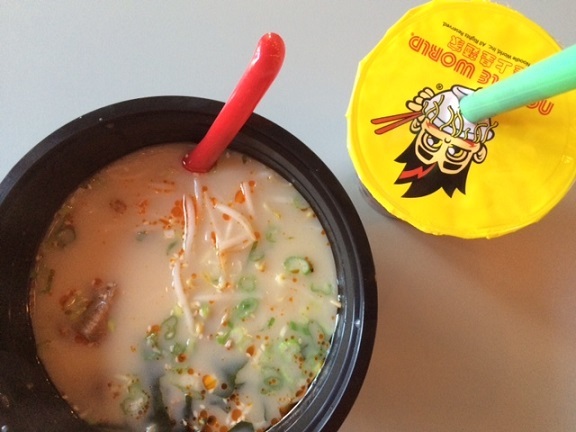 Restaurant of the Week: Noodle World Jr. This small chain opened a location out our way in April 2014. Technically it’s in Upland, but it’s only a couple hundred yards from the Claremont border. 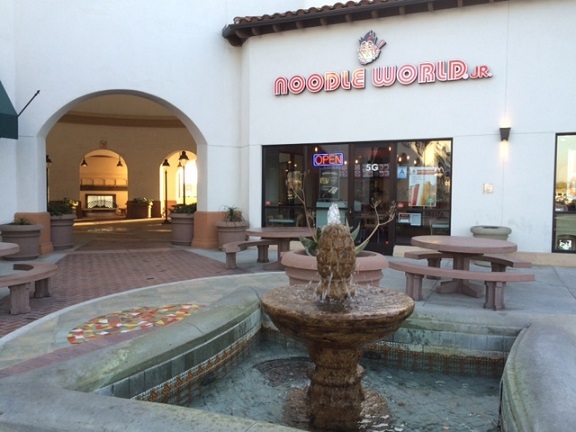 In fact, with Claremont McKenna right across nearby Claremont Boulevard, it’s possible Noodle World Jr. is closer to some of the campuses than any other restaurant. 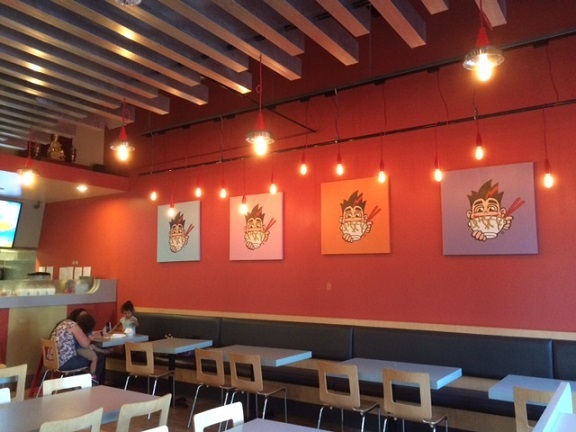 Pay attention, students: Noodle World is a sit-down restaurant with locations in Alhambra, Monterey Park, Pasadena, San Marino and Westwood; Noodle World Jr., which is only in Hollywood, Downey and now Upland, is fast-casual (order at the counter) and with a limited menu. It’s pan-Asian, with items representing China (fried rice), Japan (ramen, udon), Thailand (various noodle dishes) and Vietnam (pho). 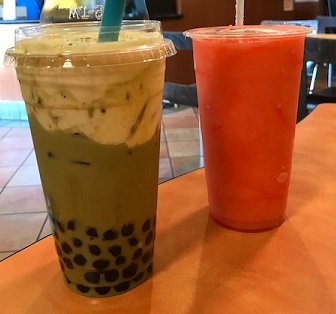 And they have boba, although not enough to satisfy a boba connoisseur. There’s seating inside as well as outdoors in a covered courtyard with a high dome roof. I’ve been there three times so far. First time I got garlic chicken ($8.25, pictured below), which is chicken sauteed with garlic flakes, served on rice. I’ve had this at Thai restaurants like Mix Bowl and this was a very good example. I also had a Thai tea with boba ($3). Next visit I tried the spicy beef ramen ($8.25, bottom), which has tonkotsu broth, noodles, bean sprouts, seaweed and stewed beef. I’m no ramen specialist, but this made for a satisfying meal on a cool evening. (A professor friend at the colleges calls this “an A- rendition of the classic.”) A taro smoothie with boba ($3.75) hit the spot too. Since then I’ve been back for beef steak with rice ($8.75), another winner. This won’t replace favored Asian spots in the 626 or beyond for those who can parse ramen varieties or know regional Chinese cooking, but for a local option, especially in Asian food-poor Upland and Claremont. Noodle World Jr. is quite welcome. And I suspect it’s practically an unofficial Claremont Colleges dining hall. Guppy House is a cute name for a restaurant, reminding me of Cap’n Crunch’s ship, the SS Guppy. 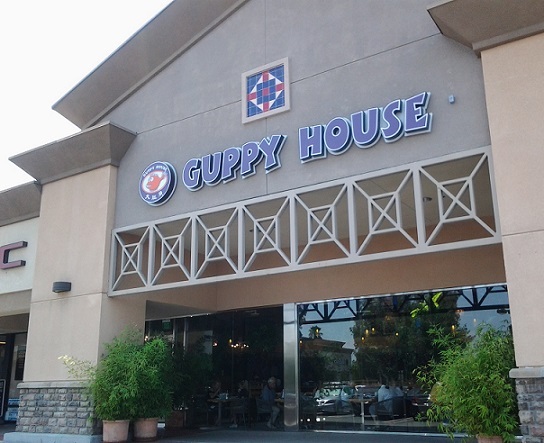 Guppy House is an Asian fusion eatery with outlets in Hacienda Heights, Cerritos, Anaheim and Irvine, plus Chino Hills. They were founded by David Li, a Cal Poly Pomona alumnus. He’s Taiwanese and his parents owned a French-Italian restaurant in Taiwan, so he knows a little about cross-cultural cuisine. 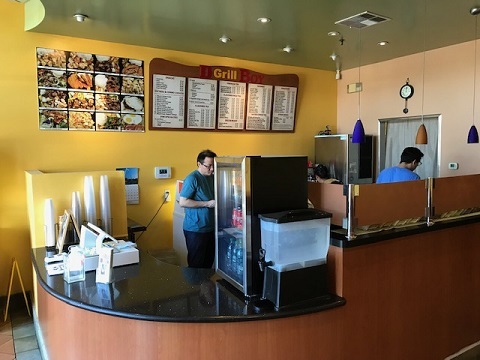 Chino Hills’ Guppy House is in a sprawling shopping center just paces from two other Asian eateries, Boiling Point and Green Banana Leaf, and not far from 85 Degrees. Guppy House’s menu melds Filipino, Korean and Taiwanese food and has such items as hot pots, kimchi, noodle and rice dishes, and boba drinks. A friend and I met there for lunch recently. 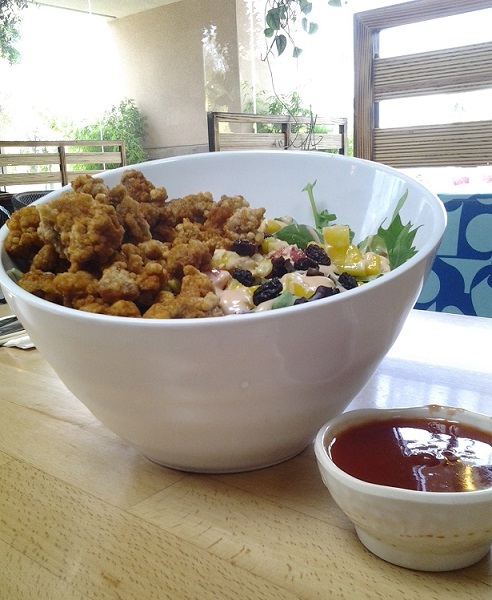 We had a signature item, popcorn chicken, with strawberry and mango salad ($10). The chicken, reminiscent of popcorn shrimp at Red Lobster, didn’t live up to the hype; the salad was colorful and well-made. We also had a dish named superb meatballs ($10), two enormous meatballs in a hot pot with cabbage and noodles, which was flavorful. For dessert we shared the brick toast, another signature item, with coconut and pineapple ($6). Thick toast drizzled with chocolate, it was a knife and fork dessert and surprisingly delicious and filling. 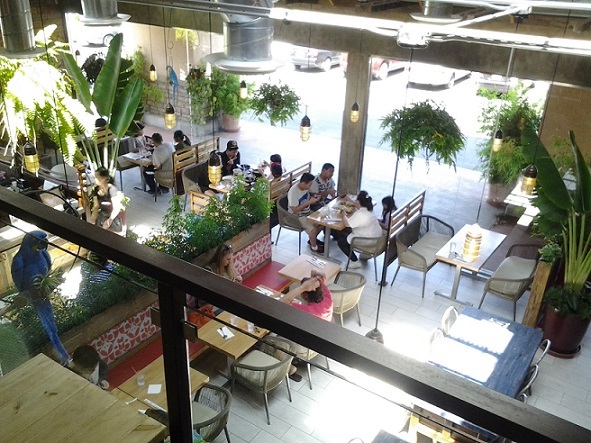 The restaurant has a glassed-in patio with comfortable chairs, probably good on a warm evening but not so good on a hot day as there’s no shade. The interior is modern and stylish with lots of glass and natural light, plants, fake parrots and a high ceiling. A mezzanine has a TV and living room-like comfy chairs and coffee tables; it seems to be more for drinks or parties. Guppy House has unusually late hours: It’s open 11 a.m. to midnight Sunday to Thursday and until 1 a.m. Friday and Saturday. Like the name, the hours are adorable too. 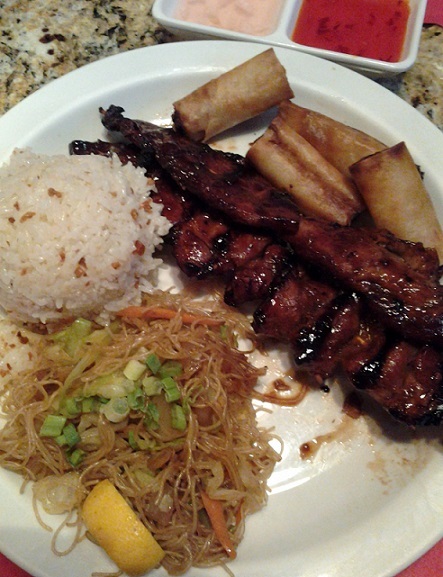 One of the valley’s few Filipino restaurants, Green Banana Leaf is located in a sprawling shopping center with a Costco, Sport Chalet and vacant Best Buy. Several Asian eateries are in an L-shaped wing by Peyton Drive, including Guppy House and The Boiling Point, with The Crabby Crab coming soon. I met a friend at GBL for lunch. 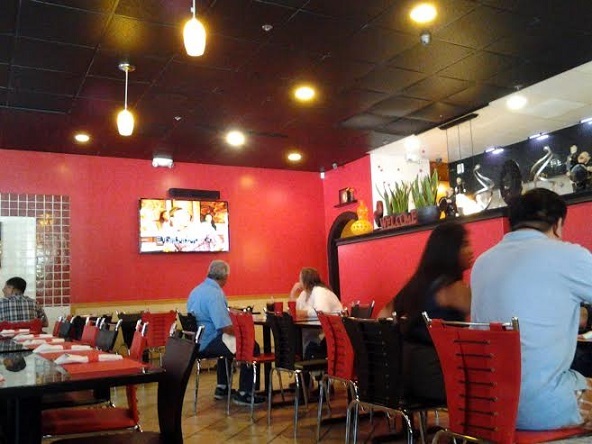 It’s an inviting spot, with a row of private-seeming booths, a red and black color scheme and hanging fixtures. Snazzy. We ordered off the lunch menu: pork BBQ skewer and chicken BBQ ($6.50 each, below and bottom). First came cups of mushroom soup in a clear broth. The plates had lumpa, which is akin to a small egg roll, and rice with dried garlic; I had noodles and my friend had a salad. The entrees themselves were mouth-watering. We liked the rice and lumpia. The noodles were nothing special, but neither was the salad, although it had romaine rather than iceberg. 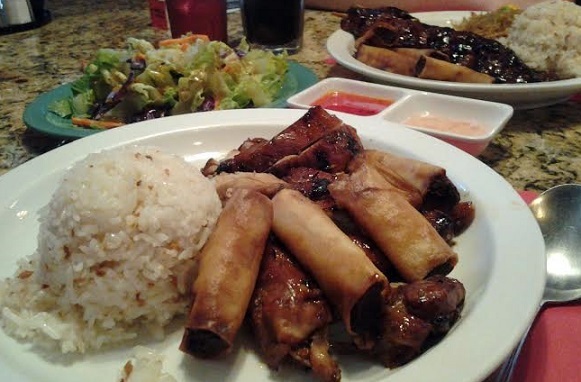 I don’t know how this stacks up with other Filipino restaurants, having only had that cuisine a time or two before, but this was one of the better meals I’ve had recently.